Great knife—I picked up one of these a couple of years ago when they first showed up on Blade HQ. 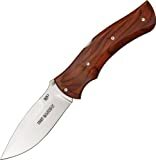 Mine has the cocobolo wood handle and lacks a pocket clip. It is a big knife for sure! The only thing I don’t like about it is the sharp top end of the back of the handle. Holding it in the standard saber grip with my hand hanging over it isn’t comfortable. It is the smoothest lockback action I have used. Thanks for stopping by. Glad you like yours too, I think the ones with the Cocobolo handles are especially nice looking. In regards to the sharp end on the handle, I noticed that too and agree that it is uncomfortable. It would be nice if they could do something there that doesn’t compromise the looks too much.